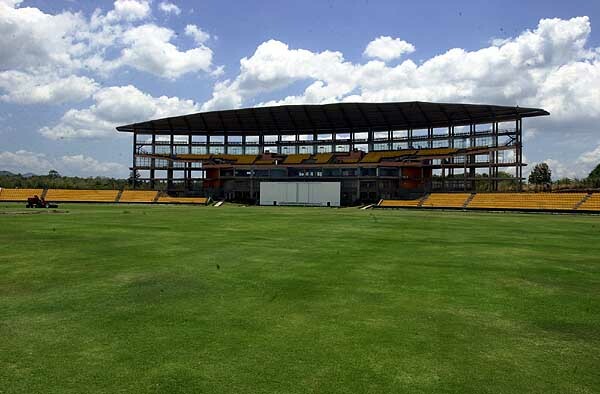 In early June 2007 it was announced that at least one of the matches against the touring English side would be played at Rangiri Stadium, Dambulla. Given the questions around the failure of Sri Lanka Cricket to utilize that stadium in mid-2006 this was a welcome announcement. Surrounding this issue, too, is the fact that the story of Rangiri Stadium has been the bewildering silence surrounding the history of this asset and the absence of investigative reportage by those located on the ground in Sri Lanka on what is a significant cricketing issue. Surrounding this issue, too, is the fact that the story of Rangiri Stadium has been the bewildering silence surrounding the history of this asset and the absence of investigative reportage by those located on the ground in Sri Lanka on what is a significant cricketing issue. Despite locational disadvantages, I chanced upon facts, notably some pressed by Tony Grieg, in ways that enabled me to pen an article on the subject on 20 January this year. However, the essay has been kept in cold storage till now so that it would not jeopardize delicate negotiations involving the highest in the land. That these negotiations took so long is a pointer to the commentary inserted at the end of my essay, remarks that go beyond cricket to principles of good governance in any field: in-built speed of decision is good process. Where a political system demands that one runs to Sirimavo Amma, Chandrika Akka or Mahinda Chinthanaya for every issue from A 100 to Z 2000, there one has poor process and dilatory outcome. That said, one can hardly blame the Dharmadasa board for recourse to such a process – not when powerful entrepreneurs and/or monks stand in one’s way. Indeed, the outcome justifies the means. Cricket-lovers can rejoice. Rangiri is back on board with the SLC board. The idea of constructing a stadium in the dry zone site of Rangiri near Dambulla was initiated and carried out by Thilanga Sumathipala, the dynamic President of the BCCSL (as it was then known) circa 1999-2001. The principal inspiration for this venture arose from the fact that the period May-to-October was the most suitable time for many major cricketing countries other than England to tour the island because it was their off-season. In this period the cricketing venues in the south-western quarter and the Kandy Plateau were subject to the vagaries of the monsoon so that some games could be totally washed out – with serious repercussions for cricketing revenues besides potential enjoyment. When visiting Sri Lanka in mi-1999 I recall a discussion at the Aiwa Cup with Skandakumar, a true servant of SL cricket over the years, where he argued against such a venture. His contentions were that (A) the hotel facilities in the area were limited; (B) that Pallekele (Pallakälay) in the Dumbara Valley had the same rainfall patterns and would be accessible from hotels in the area and (C) that the monies would be better spent in providing more sponsors’ boxes in some of the existing stadiums (which in turn generated more revenue) and upgrading the other facilities at those sites. Skandha is as erudite as intelligent, but I thought his views on this issue position were misplaced. For one, my familiarity with the flat, straight roads in the Habarana-Dambulla locality told me that, timewise, hotel access was as good as, say, that between Coral Gardens in Hikkaduwa (The Lighthouse had yet to take root) and Galle; or for that matter between a hotel like Le Kandyan and both Asgiriya and the Pallekele sites because the traffic congestion in Kandy town is so horrendous. In any event I was certain that a stadium in the Dambulla or Habarana area would serve as a “growth pole” and boost the expansion of business in a wide area, besides encouraging cricketing talent in that region. Subsequently, I discovered that Dambulla had been a thriving economic hub for decades with a market that never sleeps. This was courtesy of an eye-opening essay by Bandula de Silva (now available in Essaying Cricket, Vijitha Yapa Publishers, 2006, pp. 213-15) that revealed to what extent some of us (me too) live in urban cocoons. So the only pertinent objection was the issue whether the monies were better spent on other grounds. Sumathipala was the supremo, however, and nothing held him back. Not only that, he decided to site the new project on land in the possession of Dambulla Vihara through a leasehold arrangement with Inamaluwa Sri Sumangala Thero (see below) and to complete the stadium by the time of the English tour in early 2001 (one ODI was played at Rangiri on 23 March 2001). The latter objective was an impossible deadline. Sumathipala achieved the impossible. He worked like a man possessed, with his customary drive, a capacity that has seen me compare him – though that is not the only ground for my comparison if one considers the fate/tales surrounding around Richard de Zoysa and G Amarasinghe – to one Premadasa Ranasinghe. Grapevine tales indicate that Sumathipala often woke up around 4.00 am and was driven down to Dambulla to supervise matters and then arrived back in Colombo around 2.00 pm to see to other business. This achievement of a stadium constructed in next to no time, a world record in fact, came, however, at a price. Expenses ballooned because of overtime rates, while accounting procedures were thrown out of the window. The lack of transparency and the shortcomings in investigative journalism means that we are uncertain what the original estimate of costs was reckoned to be. I, for one, have heard of the figure Rs. 75 million, but can hardly vouch for this fact. In any event the contract was given to Sierra Constructions, a firm involved in telecommunication cables and without any experience in major building work. By pure chance I discovered one vital fact: the head of Sierra, wanted the job and quite deliberately underbid. He won the call. Unlike the reputed firms, Sierra put together a young team of architects and builders. This body was ready to take risks, but adhered to rigorous standards. They also decided to import the roof for the main building from Australia. This was an enormous cost, but probably a wise step. The result, though, was another record: the total cost at “book value” in the SLC records today stands at Rs 611 million. The stress here must be on “book value.” There were as many as eight different contractors working at the site at some points and since record-keeping is not a Sri Lankan forte (the LTTE is an exception) only the gods above will have the total figure or be privy to the underhand arrangements if any. The figure of Rs. 611 million is way above the figures that originally guided the decisions to build Rangiri and to select Sierra for that work; and was quite enormous for its day and age. It can be argued that a similar construction today would cost as much (and indeed the new Pallekele Stadium is estimated to be that much). But the picture is clear: less haste and a more reasonable time-line would have meant less cost and also may have supported a more considered plan that built adjunct fields for other sports within the overall project so that Rangiri became a multi-sports complex. As it stands today, of course, Rangiri Stadium is an asset. But from 2001-2007 it was also a flawed asset – seriously flawed. The ground environs are truly picturesque, but the shortcoming lies in the choice of site and its tenurial arrangements. The Dambulla Vihāra, and thus Inamaluwa Sri Sumangala, has ownership rights to all land within a hoo-ya of the rock – a claim that extends far and wide in the result. Why Sumathipala chose a spot within this range is not known to me – and seems amazing when there is crown land not that far away. But whatever it is, he, and thus SLC, entered into some sort of leasehold agreement with Inamaluwa Sri Sumangala Thero. I do not know if the agreement has been quite the same throughout the period 2001-07 (more below), but apparently the good thera ­contravened the regulations governing the use of Buddhist temporalities in whatever he did. Pause: having brought you to a point of climax, let me build suspense through a digression that clarifies how I came to pursue the matter. One day in August 2006 one cricket-starved Michael Roberts ventured optimistically to the SSC grounds hoping that the rains would stay away and enable the Indians to take-on the Lankans in their ODI game. The gods did not relent however and at some point later Roberts wondered over to the TV commentary box. It was mostly deserted, but Ranjit Fernando was there and in the course of our conversation Tony Greig walked in. Introductions followed and, as they say, one thing led to another. It was Tony who raised the issue of Rangiri. The reason was explicit: given that rain had been a continuous spoiler of the triangular ODI series (the Safs had not run away Sri Lanka as yet), he asked why the series had not been scheduled for the drier region around Dambulla (where it was, I believe, also raining, but maybe not in buckets). When Tony had put this proposition to Dharmadasa, the latter had countered by stating that the priest was demanding a “king’s ransom.” But Dharmadasa had also informed Tony that there were serious security concerns expressed by both visiting teams regarding a trip to the Dambulla area. Tony then told Ranjit and me that once the issue of security was raised, he had no right to question the decision not to use Rangiri for the triangular series, but he was clearly puzzled by the other difficulties in utilising Rangiri. That is why he had raised the topic with the two of us — to convey his findings. But remarkably, and perceptively, Tony concluded with this telling remark: “I do not who is lying” (to him). Well, I cannot answer Tony. But we do not need to follow that line of inquiry because the critical give-away is within Sumathipala’s statement. That is, the priest had the power to demand annual rent or usage rent. Wow!! 611 million rupees spent on an asset built by SLC without firm 99 year leasehold rights!!!!! WHY? SO THAT ONE POWERFUL KINGMAKER COULD HOLD THE SHOTS AND TREAT THE STADIUM AS HIS POCKET-BOROUGH. This is truly gross! Only in Sri Lanka? Maybe so. But this story is a standing indictment not only of Sumathipala, but all those who served on the governing boards he or his proxies commanded during recent years. The Interim Board under Malalasekera (March 2001-April 2002) had smelled something fishy and tried to use the Ministry of Sports officials to pursue matters, but did not get very far on that route. They were exploring the possibility of acquiring the land under the Land Acquisitions Act when they were deposed in April 2002. There is a silver lining. Even by August 2006 the Dambulla priest was coming under heavy fire from local business interests for killing the prospects of trade-from-cricket (Tony’s info—truly remarkable guy Tony). Moreover, Dharmadasa and the present board have since moved heaven and earth (literally – once a monk is involved) in order to take control of Rangiri Stadium. I do not have further details, but a good authority indicated that it involves the personal intervention of President Mahinda Rajapakse for this entirely reasonable change to be secured. Those in the know in Sri Lanka will tell you that the Dharmadasa brothers (and for that matter the Chairman of the Petroleum Corporation, one Ashantha de Mel) are close to the President and that there are considerable Southern Province business interests interlacing their relationships. In relation to Rangiri this intertwining has wrought good effects. But, as footnote and parenthetically, one cannot but ponder over the process of reform in this field as a general reflection about Sri Lankan society. The monk at the centre of the Dambulla mosque fiasco is a crook then? A racist crook. Must be a good friend of Mahinda Rajapaksa. These people may be racist crooks or crooked racists would not matter as long as the people are race blind and straight. It appears that the people are either supportive of these bigots or actively participating in their heinous crimes. Most of them are either making money or trying hard to make ends meet. Rest of them don’t give two hoots about anything really. If people chose not to occupy the central position in shaping and subjecting public figures to close scrutiny Sri Lanka will continue see many more bigots and crooks. One rule for Sumathipala another for poor Muslims. One for Cricket another for Islam. Hell hath no fury than a monk scorned. Another wonder of Sri Lanka – The wonder of Asia. Thank you DBSJ for elloborating another diamention of ven, thero. In order to get the clear picture, I think it will help if you produce the reply of thero or Mr, Thilanga Sumathipala in this regard. I am glad that we are going back to a period before Prof. Roberts Tiger Mania. Unlike those days he is still intent on understanding the strange Oriental heritage of the elusive Tigers…. Monks, I thought give up on simple material desires when choose the path they chose, like sisters and priests in the Christianity. When saw a few entering parliament, I thought there were some exceptions. But seems I am wrong in my understanding. Do not they get all facilities from GoSL until they have been graduated? GoSL spends on them, in the hope that they will help preserve the ‘Buddha Sasana’ and spread the path of ahimsa. But this Sumanga seems more capable of running a business empire than being confined into a vihara/pansala. Being a cricket lover, I love to see him in the net than in the forefront mobilising the devotees to follow his current path of confronting the Imams. For the sake of Buddhism and cricket, he should better give up on one, better the former, as there are not much left to bludger at this age. On the other hand, cricket and the business venture he indulges in, would take him to new a dimension. Given he has got the gut and the ball; I think it is a much quicker path for him to attain nirvana. Hope, the real and genuine Buddhists will definitely forgive me for my writing. Not intended against Buddhism what so ever, I do worship Buddha. However, people of his type are a drag on the religion itself and their motives of using Buddhism to come into prominence is like taking a ride on you all. At a time when people like him to be seen at the forefront uniting the people, to take the country forward, this guy waiting for an opportunity does just the right opposite driving a wedge between the majority and yet another minority. Do we need one more calamity? Thanks DBS J for posting this, missed this. A slightly different story when the Tamil Union Cricket grounds was left to play at the SCC??? The tamil Union grounds was the best cricket pitch as valued by Australian and English teams at that time. This is life of democracy! Good stuff! The rot starts at the top! And so too must the buck stop at the top. Sumathipala should tried for fraud and his bank accounts frozen, but instead is thriving and Rajapakse and his other cronies are making money head over heals– building similar white elephant infrastructure all over the country on Chinese loans in Hambantota (much like Burma some years ago when it turned its back on the west), while the soaring national debt is depreciating the rupee, now in free fall and raising the cost of living and taxes. This is all indicative of the fact that the poor pay for the corrupt governance and regime excesses of a country whose minister of economic development has not got a basic degree. The Rajapakse brothers, Basil and Gota who also has not got a degree would be jobless if it were not for MR and should be sent packing. They are militizing Lanka to stay in power and make profit! Sumathipala should be tried for fraud and his bank accounts frozen, but instead is thriving and Rajapakse and his other cronies are making money head over heals– building similar white elephant infrastructure all over the country on Chinese loans in Hambantota (much like Burma some years ago when it turned its back on the west), while the soaring national debt is depreciating the rupee, now in free fall and raising the cost of living and taxes. This is all indicative of the fact that the poor pay for the corrupt governance and regime excesses of a country whose minister of economic development has not got a basic degree. The Rajapakse brothers, Basil and Gota who also has not got a degree would be jobless if it were not for MR and should be sent packing. They are militizing Lanka to stay in power and make profit! The country has Cricket stadiums in Kandy, Dambulla, Angunukolapelessa, Galle, Kettarama, SSC, Saravanamutthu,……going by the cost of construction of Dambulla stadium….each would have costed a minimum of Rs 500mn -600mn. Considering the total cost is Rs 3,000 mn …how many matches are needed to recover the cost alone …apart from the ROI ? What about the maintenance ? on a 65,000 sq km the country has 10 cricket stadiums for 20 mn population out of which only 1 percent that plays cricket…….on that basis imagine what India should have which 300 times bigger……5000 stadiums….we are a failed state beyond doubt and are speeding on the path of no return……..there is absolutely no pont in talking about the Buddhists priest in this Country who are a shameless lot to this so called Buddhist Country……they sell Lord Buddha for survival……..
We all know what had happened to SWRD when he failed to accommodate the interest of Mapitigama Buddharakkita Thero and Vimala Wijewardene combine to start a shipping company business. So it is natural for people in top positions to bend this way and that way to safeguard themselves. My words are full of wrath’s mixed with foul language to hurl at Inamaluave Sumangala thera & Sumathipala . I refrain as a gentlemen. It is applicable to monks and not to the Sinhala/Buddhist/Aryan saffron clad bullies, thugs, bigots, ………..etc. I am sorry you have got it wrong in the first place and please don’t repeat the same mistake again. Yes it is a disgrace to the teachings of Buddha. A well respected religion has been made unworthy by the Sri Lankan behaviour and pracitices. These fellows should be made to kneel down and taught Buddhism, until they are able to practice it – until then they should be put on starvation. They are meant to go with the reciever and go round until food is given by the people, else they fast. How shameful for us all. Any other hope? Beloved-of-the-Gods, King Piyadasi, honors both ascetics and the householders of all religions, and he honors them with gifts and honors of various kinds. 22 But Beloved-of-the-Gods, King Piyadasi, does not value gifts and honors as much as he values this — that there should be growth in the essentials of all religions. 23 Growth in essentials can be done in different ways, but all of them have as their root restraint in speech, that is, not praising one’s own religion, or condemning the religion of others without good cause. And if there is cause for criticism, it should be done in a mild way. But it is better to honor other religions for this reason. By so doing, one’s own religion benefits, and so do other religions, while doing otherwise harms one’s own religion and the religions of others. Whoever praises his own religion, due to excessive devotion, and condemns others with the thought “Let me glorify my own religion,” only harms his own religion. Therefore contact (between religions) is good. 24 One should listen to and respect the doctrines professed by others. Beloved-of-the-Gods, King Piyadasi, desires that all should be well-learned in the good doctrines of other religions. Beloved-of-the-Gods, King Piyadasi, conquered the Kalingas eight years after his coronation. 25 One hundred and fifty thousand were deported, one hundred thousand were killed and many more died (from other causes). After the Kalingas had been conquered, Beloved-of-the-Gods came to feel a strong inclination towards the Dhamma, a love for the Dhamma and for instruction in Dhamma. Now Beloved-of-the-Gods feels deep remorse for having conquered the Kalingas. There is no country, except among the Greeks, where these two groups, Brahmans and ascetics, are not found, and there is no country where people are not devoted to one or another religion. 26 Therefore the killing, death or deportation of a hundredth, or even a thousandth part of those who died during the conquest of Kalinga now pains Beloved-of-the-Gods. Now Beloved-of-the-Gods thinks that even those who do wrong should be forgiven where forgiveness is possible. their wrong and not be killed. Truly, Beloved-of-the-Gods desires non-injury, restraint and impartiality to all beings, even where wrong has been done. Now it is conquest by Dhamma that Beloved-of-the-Gods considers to be the best conquest. 27 And it (conquest by Dhamma) has been won here, on the borders, even six hundred yojanas away, where the Greek king Antiochos rules, beyond there where the four kings named Ptolemy, Antigonos, Magas and Alexander rule, likewise in the south among the Cholas, the Pandyas, and as far as Tamraparni. 28 Here in the king’s domain among the Greeks, the Kambojas, the Nabhakas, the Nabhapamkits, the Bhojas, the Pitinikas, the Andhras and the Palidas, everywhere people are following Beloved-of-the-Gods’ instructions in Dhamma. Even where Beloved-of-the-Gods’ envoys have not been, these people too, having heard of the practice of Dhamma and the ordinances and instructions in Dhamma given by Beloved-of-the-Gods, are following it and will continue to do so. This conquest has been won everywhere, and it gives great joy — the joy which only conquest by Dhamma can give. But even this joy is of little consequence. Beloved-of-the-Gods considers the great fruit to be experienced in the next world to be more important. Good article revealing the background to the construction of the Dambulla stadium and an enterprising monk and some businessmen. However,reader comments lacks decorum and shows the enthusiasm of some waiting for an opportunity to bash sinhala buddhists or the Rajapakse regime. no matter if he or she is Sinhala, Tamil or Muslim!!! now one terrorist to replace another in our lovely country. Now sri lanka is not coloney of ENGLAND&&WE ARE SINHALIES ,we have freedom to make a ground a any where,,this money is 75%tax of snhalies,,the BUDDHIST MONKS are always favor to develope our country.BUT MUSLIMS dont want to see it ,they are radicals.they dont want to live with pace!!!!!! I don’t know about Thilanga Sumathipala’s business interests. But these land belongs to Rangiri-Dabulu temple. I don’t think anybody give land to anyone without money if it is for a commercial enterprise or not. Inamaluwe Sumangala thero doing a great job to promote Buddhism in SL. The Rangiri-Dabulu radio and TV station are fine examples. The radio and TV channel purely dedicated to religious purpose,so anybody can understand that it generate no income or profits. But thero need to pay the employee’s and need money for maintainance. The most viewers in DBSJ column, diaspora and now muslims criticising thero because they cannot simply endure the thero’s commendable service to the society. In our past we experienced the monks who did a commendable service to buddhism and the society face sudden mysterious deaths. Now the people who conspirate against those great monks and killed them cannot do anything to Inamaluwe Sumangala thero, now carry on mud-slinging campaign to tarnish the image of thero. In present complex society a monk’s duty not confined to meditation and mind his own spiritual affairs. The society expects more than that. If monks stay like that the sinhala society and the buddhism eradicate many centuries ago from this country. That’s what these mud-slinger’s and conspirator’s need. The muslim pray station and the kovil are situated in the land, which given to government by Rangiri-Dabulu temple in 80’s to the late President R.Premadasa’s request to declare a buddhist sacred area. The 300 acre land gave to the government for nothing to declare as a buddhist sacred area. The muslim pray station erected after that. Because of President Premadasa’s sudden demise the proposal of buddhist sacred area diminished and more cadjan huts,small boutiques erected around Dabulu rock. The politicians who dislike thero gave fullest support to these illegal encroacher’s. Janaka Bandara Thennakoon is one of them. The muslim people who came to Dabulla Economic center choose one of these illegal hut for their prayer’s and that’s how this small pray station[cannot say it is a mosque]begun. ANY PERSON WHO HAS BRAINS CAN THINK WHEN THIS ECONOMIC CENTER OPEN. And then can come to the conclusion, when this muslim pray station begun. Now suddenly muslims,diaspora screaming that this is a muslim mosque which has 60years history. SRILANKANS HAVE TO SUFFER MORE THAN AT PRESENT TO REALISE THE PRESENT POLITICIANS ARE INTERESTED ONLY ABOUT THEMSELVES.KEEP ON TALKING ABOUT THE 2500YR BUDDHIST CULTURE AND SELL THE COUNTRY.UMBALATA HATH HENA GAHANAWA PARAYO. Hope the population understnad their trechery soon. I have heard a story on how the concept of Mahanayakas came to Buddhist culture. It is as follows. When the real Buddhism were in existence in ancient time, most of the monks were spiritually developed and served the society as true leaders. However there were monks who could be called, in modern language as ‘Jokers”, who are not capable of achieving anything in the spiritual dimension. In short they were the foolish lot. In order to keep them engaged for some work, they were asked to look after materialistic assets such as lands. (Those days there were no concept such as land rights. Lands which is a natural resource like Air, water were belonged to everybody and temple played the role of allocating the resources for food production as and when necessary). In short those backward group was the watchers whose only qualification was spiritually backwardness. This so called Maha Nayakas in Present day are the generation of those watchers. So what is happening could be expected under present legal system related to land policies. They naturally become tools for businessmen and corrupted politicians. If the Inamaluwe thero is an anti islamic he never stop from Dambulla. The thero is fighting for Rangiri-Dambulu temple land. If a muslim person who sell something to pilgrims who come to temple and living in the temple land and start a pray center in the back of his boutique and then expand it to a small praying center,it is not a mosque. If it is 100 years old or just 10 years it is an illegal structure. The people who criticise the monks behaviour,simply ignore the fact that this ia an illegal structure. It is normal that thero’s losthis patience after 30 years of pain and agony he suffered to declare Dambulla as a sacred area. It is normal thero lost his patience when in front of his eyes other religious groups erecting praying centers,kovils in temple land which he gave to government to declare as a sacred area. If it was an illegal structure the Bhikku should have taken recourse to the law and ot tried to take the law into his own hands. Within the Sinhala community at least, the racists generally are crooks. Although the converse is not true- that all crooks are racists- I would say that the most cunning crooks are racist to hide their thievery.